We had a couple of nasty storms move through our area today. As I sat on the 2nd floor of a building in an all day workshop and watched the rain move in, I had some thoughts about the vantage point from which I was watching the rain and from my reactions to the rain in the past few years. I didn’t get upset or afraid – a reaction I might have had as a child. I knew it was only a matter of time before the storm passed and the beautiful, sunny sky would re-appear. Perhaps with the blessing of a rainbow, too. As I’ve aged, my perspective on rain and thunderstorms that we experience during our lives has changed. What I define as a crisis has changed. My father had a saying, when something wasn’t that big of a deal, he’d remark “That’s small potatoes.” The point was that whatever he was referring to was small stuff – and we’ve all heard the saying “Don’t sweat the small stuff.” This was his version of saying the same thing. I’m starting to realize that most of what I once worried over is indeed “small potatoes”. My life during the past 3 years has been filled with more pain than I’ve ever felt in my life. I’m not ready to reveal more detail than that, but I will say that I’ve learned an incredible amount about myself during this storm. I’ve come across a few awesome perspectives I’d like to share with you if you’re going through a seasonal storm in your life. Some words that have brought me peace and confirmation that this too shall pass. My favorite inspirational quote that I’ve seen in the past few years is this one from Cynthia Occelli. There have been times when I’ve felt that everything in my life was falling apart all at once, but perhaps it’s all lining up to fall into place. Only time will tell how these tumultuous years will affect the rest of my life. It’s been frustrating to put my business goals + plans on hold more times than I care to count. I’ve let my fears get the best of me and I returned to the working world. I understand that this journey may not make sense to me at the moment. However, as in past situations – I am sure I’ll look back on this time later in my life and realize that everything came together as it needed to – all in due time. This is certainly a test of my faith and I can’t say with complete honesty that I’ve passed that test. I’ve also become much more grateful in the past few years than I was previously. I’m grateful for the bounty of learning that the storms have brought to me. Another saying that my father used to utter was “No Rain. 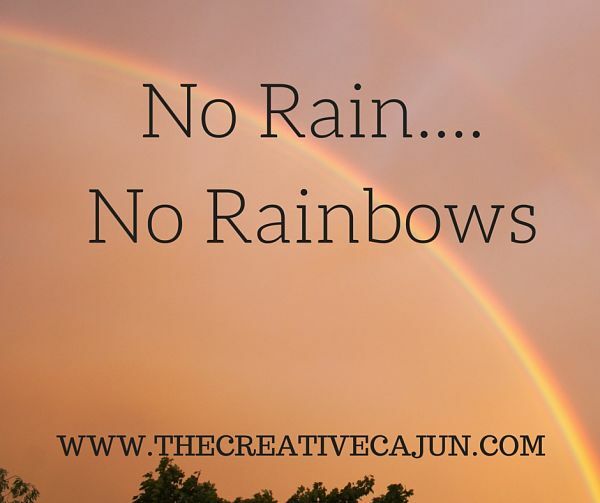 No Rainbows.” I’ve seen a few rainbows during this storm – and for that, I am grateful. What’s your favorite inspirational quote to get you through the rough days?